With more social media interactions switching to the privacy of groups and message threads, Facebook has been working to better facilitate such behavior by putting increased emphasis on groups, and boosting group engagement. A side note, of course, is that it also enables Facebook to highlight the community benefit of groups, and thus, Facebook more broadly, countering concerns about the negative impacts of The Social Network, with fake news and political interference causing divides. A big element of Facebook's push on this front has been to better connect with group admins and community leaders, in order to help them make the platform a more important part of their connective process. Along this line, Facebook ran its first Community Summit event in Chicago last year, with several hundred group admins in attendance. Since then, Zuck and Co. have run several smaller events, but now, they're putting out the call for their next big community summit, this time at Facebook's Menlo Park headquarters in February. "For the first time, we’re inviting leaders of local business and nonprofit communities to the event, in addition to people leading communities on Facebook Groups, Pages and Fundraisers. Attendees will learn from each other and hear announcements from Facebook about the latest tools and programs we’re building to support them. Workshops and small group sessions will offer new skills to help leaders define and fulfill the purpose and vision of their communities." The Menlo Park summit is also open to attendees from Canada, Mexico, the Caribbean, and the US - previous summits have mostly been US-only. And definitely, there is value in attending - through previous events, Facebook has gathered feedback which has lead to a range of new group tools and improvements, including group insights, membership filtering, new rule options, improved formatting and presentation tools, and a range of others. And while Facebook can learn much of the usage insights which have lead to these improvements through its existing data, the Communities Summit also provides Facebook with a valuable PR tool, which, as noted, has become increasingly important amid the platform's various issues of late. 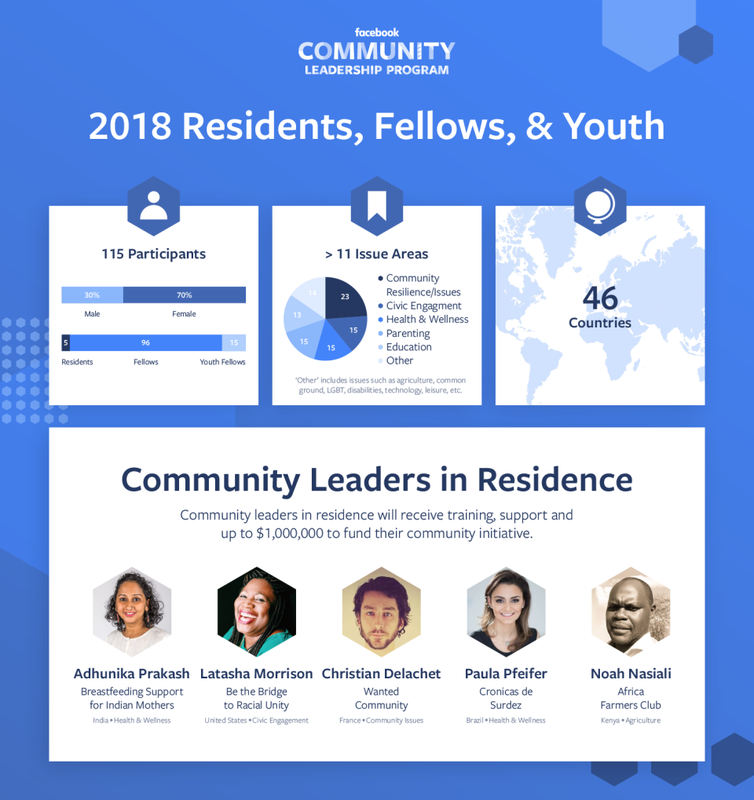 That's really the key - in addition to the Communities Summit, Facebook also recently announced its first round of 'Community Leaders in Residence', a group of five participants, selected from over 6,000 applications, who will each be awarded up to $1,000,000 to fund their community initiatives. Because Facebook - whether for altruistic purposes or PR gain - is keen to show how its platform is of benefit, that its not all bad. Facebook helps build communities, helps bring people together. Sure, there might be some fake news and personal data issues, but Facebook does a lot of good too. See? As with everything Facebook related, there's an optimistic and pessimistic angle, but clearly there is significant community benefit in having one of the world's richest companies investing in such initiatives. 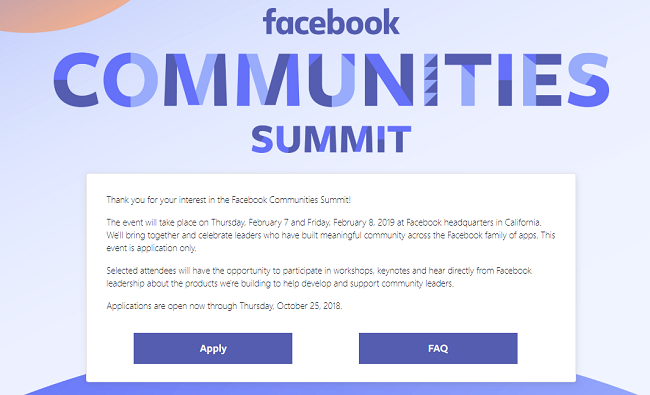 You can apply to attend the February Facebook Communities Summit here.